When nature calls in the middle of the night, the last thing you want to do is blind yourself with the bathroom light. Enter the IllumiBowl 2.0: the motion-detecting toilet light that made a splash on ABC's Shark Tank. 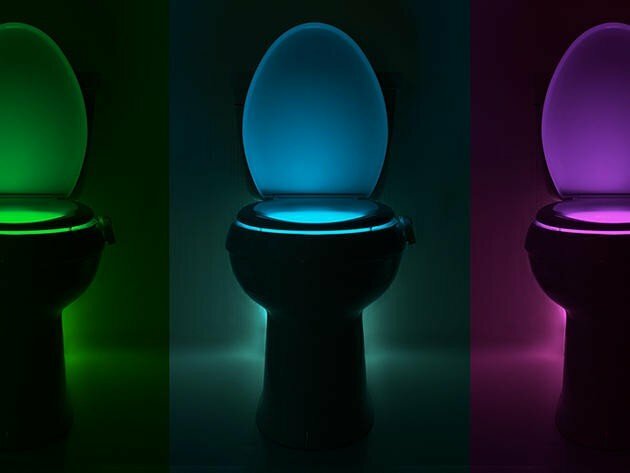 Just snap it onto your rim of your toilet, and it'll illuminate the second you step foot into the bathroom. You can choose from eight color options, or select a color-rotate light mode to keep things interesting—plus, use the three-stage dimmer to calibrate the light to your preferred intensity. And since we're talking a toilet accessory here…you'll be happy to know that this one is super easy to clean. Which is of course a must for any toilet accessory, ever. Ready to upgrade your toilet in an unexpected (and totally groovy) way? Get the IllumiBowl 2.0 for just $14.99, marked down from $19.99 for a limited time only.